At a closed-door meeting last week attended by leaders of the conservative movement, discussions centered around development of a “no excuses” list of big-ticket legislative issues to be addressed in the 113th Congress. Win or lose, the consensus among both conservatives in Congress and leaders of the movement off Capitol Hill is that a list of high-priority issues needs to be adopted before Congress reconvenes in January that will dictate to Republican Leadership, party moderates–and especially the lobbying community–that excuses for avoiding those items will not be tolerated. Just what would be included and how the concept would be structured is under discussion and won’t be finalized until after the election. But hard-liners in Congress and an impressive array of leaders within the conservative movement are convinced that without such a list the 113th Congress could slip away, much like the 112th, with little good accomplished. Many promises have been made by Republicans during the campaign – both by Mitt Romney and congressional candidates – but conservatives are concerned that the “we can’t do that” attitude, so prevalent over the past two years, is being heard from both the House and Senate Leadership, from Republican centrists and the so-called establishment, and by lobbyists and inside Washington hands, and could result in those promises going the way of the wind, as they so often do. Conservatives have no illusions about the persuasive abilities of the GOP Congressional Leadership – specifically House Speaker John Boehner, Majority Leader Eric Cantor, and Senate Minority Leader Mitch McConnell – who all will throw bones to the right wing of the Party while maintaining the inexcusable status quo. Repeal Obamacare? Of course, they are all for it, but only with meaningless votes designed to make the issue go away without dealing with the guts of the matter. Cut off funding to implement Dodd-Frank? A repeal vote, perhaps, but a vote of consequence? If it means shutting down other programs, or even the government, well, we wouldn’t want to go there. Hands might get dirty. And those junkets we read about – the trips to the Paris Airshow, to inspect military bases in Taiwan or a summer trip to Alaska? 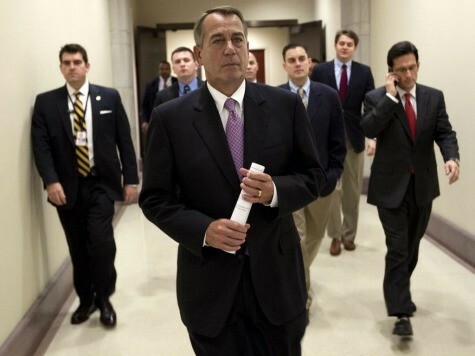 They are doled out by the Leadership, and not just because the new member of Congress is a good travelling companion. Is it any coincidence, for example, that last year’s much-ballyhooed, and thoroughly Dionysian, GOP junket to Israel involved no less than six Republican freshman–and Majority Leader Cantor? All of these favors result in votes that the Leadership wants or needs, and are put in the bank to be used when needed. Backers of the No Excuses concept believe that the list must be developed win or lose in November and, obviously, will look very different depending on election results. Even if Obama wins and Republicans are in the minority in either house (and experts believe now it is hard to conceive how the GOP will not keep the House) they can still tie things up, cut off funding, refuse to allow confirmations to go through and stop much legislative activity if they are willing to go to the mat. And a No Excuses list would be exactly that – a reason to go the mat. The list would be broad in scope but will certainly contain specifics as well. High on the list, undoubtedly, would be gutting Obamacare and Dodd-Frank, both of which could be repealed with fairly simple and straightforward bills simply disabling what was passed in 2010 – exactly the kind of legislation the leadership would like to avoid, as even the thought of such bills would throw the bureaucracy into turmoil and cause apoplexy in the lobbying community, resulting in much unpleasantness for the leadership. As certain provisions of each are already either in place or in preparation, reams on reams of regulations have been proposed or promulgated, offices staffed out and bureaucrats hired. Just in the case of Dodd-Frank, for example, it is estimated that the rulemaking process so far has taken over 100,000 pages to explain and prepare; repeal of the more than 100 rules promulgated so far could take years, and tens of thousands of hours of time on the part of agency personnel. We promised the American people that we would overturn Obamacare, put our country on a sustainable fiscal path, and implement pro-growth tax reform. We owe it to them to remain diligent and committed to our promises. President Obama may believe that he cannot change Washington, but it is up to Republicans to do what the president refuses to do. Other items likely to make a No Excuses list include block-granting Medicaid to the states, at least in some form, to reduce the role played by Washington, and enacting some sort of premium support for Medicare – both of which have been large topics in the campaign, and which would need to be enacted, in some form, when Obamacare is repealed. Balancing the budget and controlling and capping spending are also “no excuse” issues, and, perhaps rolling spending back to 2008 levels. Cut, Cap and Balance legislation, which included a Constitutional Amendment for balancing the budget, passed the House a year ago and is still high on the list, and would go a long way to getting the budget under control. Banning federal funding of abortion, an issue dear to the hearts of social conservatives, would likely be on the list, as could enforcement of the Defense of Marriage Act. Finally, it is likely that some sort of tax reform will go onto the list, such as lowering rates, broadening the base, closing special-interest loopholes or some combination of each. Maintaining the many deductions, loopholes, and exemptions in the tax code is probably the highest priority of the K Street lobbying community and something many members of Congress approach with terror. Why? Because the K Street crowd — on behalf of the multinational corporations it represents — rake in millions upon millions of dollars by lobbying for, securing, and subsequently exploiting to no end, special tax code loop holes. And every one of those lobbying firm has a PAC – which are among the largest donors to Congressional campaign committees. Milton Friedman used to call the tax code every politician’s re-election campaign funding mechanism. Special interests would do whatever necessary, he explained, to keep a member in Congress who would maintain some obscure deduction, loophole, or whatever. Without a “no excuses” pledge, in other words, the temptation to deviate from real tax reform will be so overwhelming that nothing, or very little, will be accomplished. Without something along the lines of a No Excuses list, conservatives in and outside of Washington know that 2013 could look depressingly like 2011. We expect the Romney Administration to work with a Republican Congress to achieve the following policy objectives in the 113th Congress.